In an age of increasing digitalization, online ordering has become the norm, especially for millennials. Almost every necessity imaginable is available for order with just a couple of clicks. Grocery items are no exception, but millennials have forgone buying groceries online, and in store, in favor of ordering food through apps like Postmates and Grubhub. Going out to eat or ordering food through apps may be more costly, but millennials are willing to pay the surcharge in price for the added convenience. With an endless amount of food-ordering apps and fast-casual restaurants to choose from, grocery stores are having to get more creative to compete for the increasingly fragmented millennial dollar. When it comes to food, millennials prioritize convenience. A recent American Express survey found that 62 percent of millennials reported ordering food on an app in the last six months. But millennials are also increasingly eating out at restaurants and bars. Bankrate.com reports that 54 percent of millennials eat out at least three times a week. Unlike previous generations, millennials prioritize experiences over purchasing material things, so dinner or brunch with friends at a new restaurant is more enticing than an outing to the grocery store. In an attempt to win back these customers, grocery stores are adding in-store restaurants, or "grocerants," to entice millennials to spend money in the store. 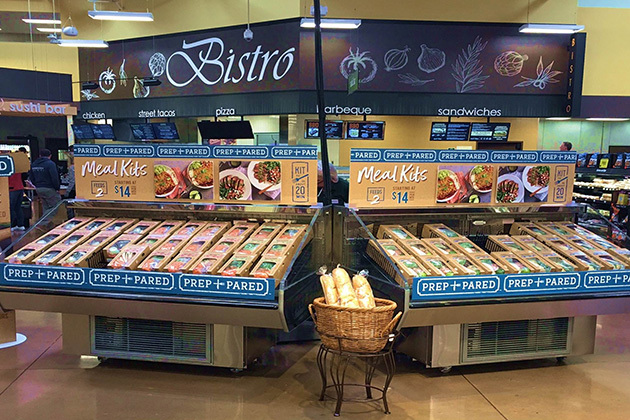 Grocery chain Hy-Vee added a grocerant called Market Grille to its Columbia, Missouri, store that has proven successful in attracting millennial customers. The store uses ingredients sold in store to create all of the menu items and offers a wide selection of craft beers and cheap happy hour pricing. The grocerant has been so successful that Hy-Vee has implemented more than 100 Market Grilles in stores across the Midwest. Kroger is also testing the grocerant concept. The Fortune 500 grocer recently announced the opening of Kitchen 1883 at its Union, Kentucky, store. The restaurant will serve American comfort food and handcrafted cocktails for dinner and lunch, along with a weekend brunch. The restaurant, slated to open in October, is being developed by the same team that successfully helped Kroger grow their meal kit business. Kroger introduced meal kits in May in Cincinnati-area stores in effort to compete with the growing meal kit market that currently makes up $1.5 billion of the food business. Millennials, in particular, have embraced meal kits wholeheartedly, with 60 percent of them reporting that they have at least tried a meal kit. By offering the meal kits at a lower price point — starting at $14 for a meal for two — Kroger hopes to capture customers who are accustomed to ordering from more expensive popular meal kits brands like Blue Apron or Hello Fresh. Since the company's acquisition by Amazon, no grocer is more focused on appealing to the millennial than Whole Foods. In addition to lowering prices, Whole Foods is also looking to get a piece of the meal kit market. The grocery store has developed an alternative type of meal kit that encourages customers to buy regularly packaged grocery items individually. Recipe cards and the ingredients needed to make that recipe are featured together on a store display. By skipping on the packaging that is essential to most meal kits, the grocer is able to cut out extra costs. Because pricing is the No. 1 reason customers discontinue receiving meal kits, a lower price point for food could prompt millennials to instead turn their local grocery store. Grocerants and meal kits could prove to be large millennial draws, but they will fail to keep the millennial customer coming back if they neglect to focus on the types of foods they offer. Millennials, more than any generation before, are concerned with knowing how their food was grown and are 38 percent more likely to buy natural and organic products. One in 10 millennials keep a vegan or vegetarian diet, and grocers like millennial favorite Aldi are adapting by providing more organic, plant-based grocery items. As millennials get older and begin shopping for their families, grocers will need to expand the breadth of their organic offerings in order to satisfy the expectations of the millennial parent. After graduating from Texas State University with a degree in mass communication in 2011, Katina Smallwood landed her first real-world job doing what she loves most — editing. She has been a content editor with MultiBriefs since July 2011 and is now branching out into the field of original content. After working with professional associations of all types over the past three years, Katina has learned about numerous fields and industries and is excited to bring this knowledge to her writing. Prior to joining MultiBriefs, Katina worked as a reading and spelling tutor for children with learning disabilities.